The first of 3 children, Nina Mbah was born in Kaduna – a major city in Nigeria’s Northwestern region. However, she traces her family’s ancestry to Achina in Anambra State, South Eastern Nigeria. Nina became exposed to the dividends of Education at a very tender age, being born into a family of passionate educationists. From her fond childhood memories, the importance of education meant her ability to do basic calculations of money received from customers while assisting at her mother’s shop after school, communicating in proper English, and receiving gifts from her parents after bringing home an excellent result at the end of each academic term. Our super girl is a professional Quantity Surveyor, who practices as a passionate Education Entrepreneur. Very often, she experiences the inability to respond explicitly when confronted with the question “what do you want to become in life?”. Perhaps, this is because she always expects the question to be paraphrased as “what problems would you like to solve?”. Ms Mbah was prompted to engage in some reflection and critical thinking, after seeing the Disney Channel movie “Jump In”, where young people competed and were awarded for simply skipping ropes. She became concerned and uncomfortable by the constant brain drain in Nigeria, largely due to the Nigerian society’s inability to recognize, encourage, and develop young talents. With this in mind, Nina geared up to champion a new era of talent recognition in her home country. Nina Mbah experienced her eureka moment as a secondary school teacher during her compulsory National Youth Service in Funtua, Katsina State (Nigeria). After observing the complacent attitude of her students towards learning, she was inspired to replicate one of her parents’ teaching methods – rewarding excellence, a major factor which contributed to her personal growth. She set up a regular classroom competition where she rewarded top performing students with lunch snacks, in order to encourage learning during her lessons. Experiencing the impact of this pilot initiative firsthand, Nina confirmed the popular saying that failure to reward excellence is another way of encouraging mediocrity. What began as small-scale classroom competitions soon grew into an inter-school academic contest across the state known as “Nina Prize”. Nina Prize focuses on connecting inspired donors/sponsors to talented young people, to ensure that educational scholarships serve as the motivation and spring board to even greater success.So far Nina Prize has brought together 27 schools in Funtua Katsina state, rewarding 9 contestants with educational scholarships. Connecting the dots backwards, Nina affirms that engaging with several networks consisting of like-minds has equipped her with the ability to seek out problems and convert them to opportunities. She has leveraged on several cross-cutting platforms, in order to sharpen her skills and pursue personal development. At the tender age of ten, Nina Mbah represented her school during the United Nations Day celebration, which was aired on the National Television Station. As a secondary school student, she was a delegate at the Nigerian Model United Nations. In 2014, Nina was nominated as a Global Youth Ambassador for A World at School, a youth education advocacy program launched by the UN Secretary General Ban Ki Moon and Special Envoy on Education, Gordon Brown. In this position, she had the opportunity to raise over 5000 signatures in support of the #UpForSchool global petition which was submitted by the Global Youth Ambassadors at the UN General Assembly in September 2015. Also, Nina participated in the premier edition of the Young Women in Dignity (YOWDI) program, an annual initiative which serves as a platform for young women to pitch ideas and solutions on how best to engage government and policymakers, especially regarding challenges facing young women which undermine their dignity and full participation in Nigeria’s democratic governance. 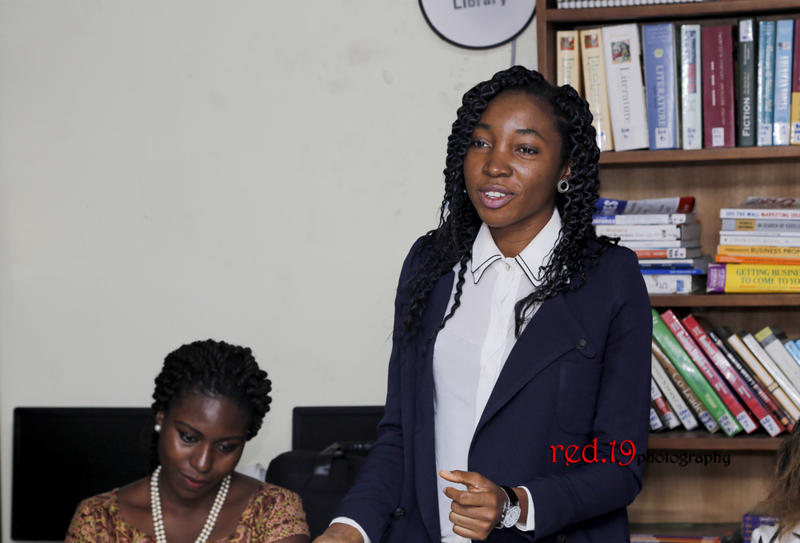 Recently, she served as a rapporteur at the Nigerian Education Innovation Summit where she was opportune to learn about various education interventions being implemented in Nigeria as well as different approaches to scaling up. In all her engagements, Nina’s intentional habit to constantly reach out to more experienced individuals for mentorship is a success habit worthy of mention. Earlier in the year, Ms Mbah was selected (alongside 11 outstanding female entrepreneurs) to join the African Women Mentoring Network. Via the Network, she receives mentorship from selected Mandela Washington Fellows and other reputable entrepreneurs and business managers in Nigeria. We are super proud of Nina Mbah, and her contagious zeal to cultivate Nigeria’s young talents!